Wildflowers of the Arboretum a series of tiles and mugs available for sale ONLY at the UW Arboretum book store. Take a look at the photos and then go there and purchase one! 6 x 6-inch ceramic tiles $12.95 each Tiles may be ordered with Glossy or Satin finish. To order MOST tiles:Click on one of the "Order a tile or coaster" links. This will take you to the bottom of the page where you can enter the item number (T-###) and name of the tile you wish to order. A FEW tiles have different size or color options.For these, follow the link immediately below the thumbnail to order. 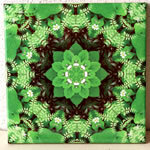 6 x 6-inch ceramic tile $12.95 each Tiles may be ordered with Glossy or Satin finish. Please enter design number and name and "Add to cart" separately for each design. If you wish to order more than one of a design, you can change the quantity in the shopping cart. NOTE: the text entry boxes do not clear automatically when you "Add to Cart". If you wish to order another design from this page, be sure to clear the text boxes and then enter the new information.